Tblaze Presents You With The Updated Streaming Media Player! Do you long for endless content and streaming options? Then the Tblaze TV box streamer is EXACTLY what you need! This media streaming device with the 2017 updated hardwarewill allow you to watch your favorite movies, shows and sports on demand! All you have to do is connect it to your cable TV and use your internet connection. That was easy, wasn't it? This Is A Complete Media Streaming System! Apart from the android TV box, the bundle also includes everything you need to connect and control the streaming device. Don't worry! The installation is very easy, so you will be able to enjoy our super-fast live streaming as soon as the TV box arrives at your house! 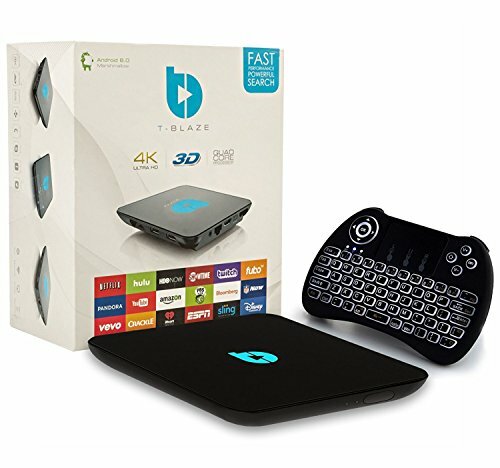 Here Is Everything You Need To Know About The Tblaze TV Box! • 1 external SD slot for expanding the memory. As you can tell, this technologically advanced media streaming device is worth investing in. So don't hold back! Place an order and if your new TV box has a problem, contact our obliging customer service so that they can help you solve it! Easy Setup and Unlimited Entertainment - Get instant access to all of your favorite movies, TV shows,sports,international channels, news, through hundreds of streaming apps that come on the box or are available through the app store!Anytime,anywhere. Real Time Firmware/App Updates - Yes Tblaze is the First Box in the World Introducing Real time Firmware Updates.Just by pressing the Home Button on the Remote Firmware/Apps Gets Updated.Our team monitors daily and keeps box at high performance. Plug,Play & Enjoy - Requiring just a basic internet connection,The Tblaze player and upgraded remote puts choice and control back into your hands.Setup and start streaming within minutes.Get more from cable using your existing cable subscription! 5-star customer service - You can get direct access to the U.S. based customer care representatives who are trained in providing support using REMOTE accessibility to the device and call back services - response mostly within 7 hours(7 days a week). THE LATEST2017 UPDATED HARDWARE:Powered by a lightning speed technology S912 64-bit OCTA 8 CORE processor,a stand-alone graphics processor, 2GB of DDR3 RAM,and 16GB of internal storage, the Tblaze TV box promises to give you the fastest performance! If you have any questions about this product by Tblaze, contact us by completing and submitting the form below. If you are looking for a specif part number, please include it with your message.